Definition at line 60 of file llface.cpp. Definition at line 54 of file llface.cpp. Definition at line 112 of file llface.cpp. Definition at line 75 of file llface.cpp. References d, f, LLVolumeFace::VertexData::mNormal, LLVector3::mV, and tut::tc(). Definition at line 101 of file llface.cpp. Definition at line 699 of file llface.cpp. References LLVector2::mV, s, and t.
Referenced by LLFace::getGeometryVolume(), LLVOVolume::getWorldMatrix(), LLViewerObject::getWorldMatrix(), and LLVolumeImplFlexible::getWorldMatrix(). Definition at line 229 of file llviewerwindow.cpp. 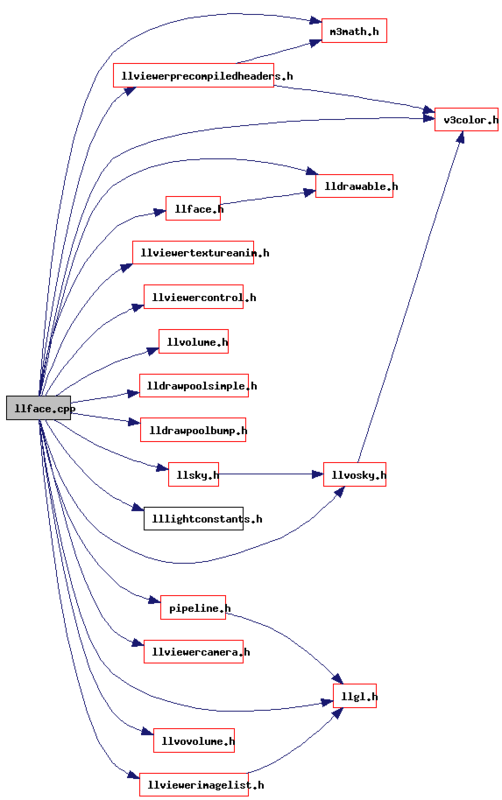 Referenced by LLViewerWindow::analyzeHit(), LLToolDragAndDrop::dragOrDrop3D(), LLToolPipette::handleHover(), LLToolPipette::handleMouseDown(), LLToolFace::handleMouseDown(), LLToolPie::handleRightMouseDown(), LLViewerWindow::performPick(), and LLFace::renderForSelect().